Würth, a multinational company, celebrated its 40th anniversary of doing business in Spain by expanding its facilities in Agoncillo (La Rioja) with solutions designed, manufactured and installed by Mecalux. Recently, the company opened a new reception and dispatch building, as well as a fully automated rack supported warehouse for pallets. 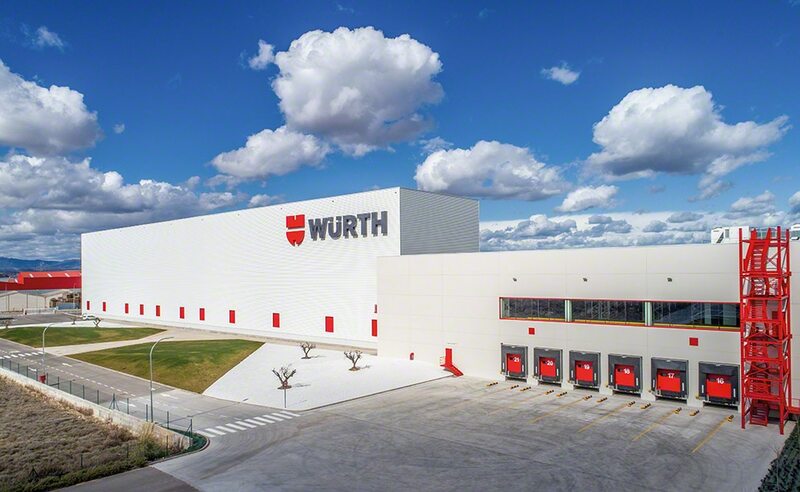 The AS/RS, with capacity for 15,190 pallets, can move up to 300 pallets/hour, helping to keep the high service level that Würth guarantees its customers for order deliveries across Spain. Würth is a German company that sells all types of fasteners, connectors and assembly components for the construction, automotive, chemical, and plumbing sectors, among others. Its extensive product catalogue, comprising over 125,000 SKUs, includes screws, plugs, drilling and cutting instruments, tools, workwear, etc. The company was founded in 1945 in the small town of Künzelsau (central Germany) as a wholesale screw business. Its headquarters are still there and the firm now employs around 74,000 people in over 80 countries on five continents. This warehouse easily meets the company’s requirements, without forgetting its growth prospects and, as such, space has been reserved for future expansion. Technology has been one of the driving forces behind Würth’s growth. For this reason, the logistics center also has the most modern equipment to store and transfer goods to the other areas automatically, with minimal involvement by the operators. Interlake Mecalux has designed the conveyors, stacker cranes, pallet lifts and electrified monorail systems (EMS) to guarantee the flows desired by the company to supply customers in the shortest timeframe. In addition, Würth’s corporate colors were even applied to components, showing Mecalux’s great attention to detail. In other words, the racks, stacker cranes, electrified monorail system, pallet lifts and conveyors are all red and white. The considerable size of the automated rack supported warehouse makes it stand out in comparison to other buildings: it is 85' high, 377' long and 75' wide. Working with tens of thousands of SKUs was a challenge for the company. So, it was essential to take advantage of available space to provide the maximum potential storage capacity. The warehouse consists of five aisles with single-deep racks on each side, each with corresponding stacker cranes for inserting and extracting goods. These machines work at a travel speed of 722 ft/min and a lift speed of 177 ft/min. They can move up to 300 pallets per hour in combined cycles, that is, entries and exits are performed simultaneously. The entire warehouse is controlled by Mecalux’s Easy WMS warehouse management system, which works in conjunction with the Würth computer system to track all goods during their entry, exit and storage. The installation includes two pallet lifts. One connects the reception and dispatch area (lower floor) with the entry and exit points (upper floor) of the AS/RS. The other pallet lift lowers the pallets from the automated warehouse to the bottom floor of the existing warehouse. The CE marking certifies that Mecalux’s products comply with the legal and technical safety requirements of the European Union’s member states. The system supplies empty pallets to use as slave pallets and to double up those the checkpoint deems as faulty. A 50' high building has been erected between the new AS/RS and the previously built warehouse. It is divided into two floors, each set aside for a different operation. Product inputs and outputs are done on the lower level through twelve loading and unloading docks. To this end, a conveyor circuit has been installed with three entry and two exit points. These pallets must cross a pallet checkpoint where the loads’ weight and dimensions (gauge) and the condition of the pallets (spaces, blocks and skids) are checked and the product is identified by reading the barcode label. Incoming single-SKU pallets are verified on this floor. Pallets with more than one SKU are temporarily placed on the racks, and later checked on the upper floor. One of the incoming lines has an automatic system that supplies slave pallets to pallets that are in poor condition. Once the goods have passed the checkpoint, a pallet lift raises them to the top floor for entry into the AS/RS. This pallet lift also lowers the pallets from the AS/RS to the dispatch area. At the exit point, the slave pallets are retrieved, stacked and used again at the entry point. The pallets to be dispatched are grouped in the preloading area on the floor, just in front of the docks, based on if they correspond to the same order or transport route. On the upper floor, an electrified monorail system (EMS) carries the pallets going into the AS/RS up to the aisle assigned to them by the Interlake Mecalux Easy WMS. At the same time, the EMS trolleys collect the pallets going to the dispatch area and move them to the pallet lift, which lowers them to the bottom floor. Multi-SKU pallets flowing from temporary storage are rechecked on this floor. Here, SKUs are separated and sorted, quantities are checked, products are identified and sent back to the automated warehouse. Two picking stations have been set up in front of the electrified monorail system. There, full-box orders are prepared from the products stored in the AS/RS. Speeding up this operation as much as possible was a priority for Würth; therefore, the installation was designed to supply up to 60 pallets/hour to each pick station. These stations are fitted out with the equipment needed to carry out the different tasks, including computers, label printers and pneumatic arms to facilitate product handling (which can be bulky and very heavy). Using the pneumatic lifting units, the operators pick items directly off the pallets, which are brought to the picking stations by the electrified monorail system, and place these items on another pallet. The products that make up each order are grouped together on this other pallet. Up to eight orders can be prepared simultaneously at the two locations. On the upper floor, a conveyor circuit connects the new automated warehouse to Würth’s original warehouse. Said warehouse, with capacity for about 10,000 pallets, is designed for products that, due to their dimensions and product type (chemicals), cannot be stored in the automated warehouse. Moreover, small-sized units are also picked here. The conveyors supply the warehouse with the products needed for picking orders. Tailor-made solution: proactive surface usage yields a storage capacity of 15,190 pallets and space has been reserved for future expansion. High-tech warehouse: the new warehouse is fully automated, which ensures high, error-free workflows. Picking as a priority: the automated warehouse incorporates a specific full-case picking area and a conveyor circuit supplies the already-built warehouse with the goods needed to pick small-sized units.